In woodlands, land use legacy, but also present habitat management can influence biodiversity and ecosystem functions in various ways. However, little is known about how former and current land use interact in woodlands with different habitat continuity and tree age. The aim of this study was to investigate the impact of both habitat continuity and tree age on ground beetles. We performed a field study in the nature reserve “Lüneburger Heide” (Germany). The study area comprised ancient woodland embedded in a matrix of recent woodland. We defined four woodland types by combining ancient and recent woodland with young and old trees and analysed five replicate plots within each of the resulting four woodland types. 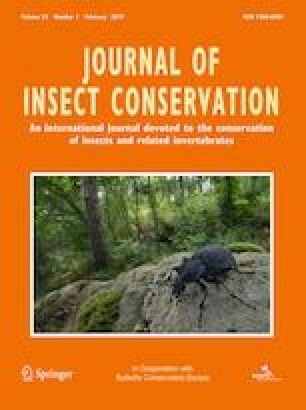 Habitat continuity, tree age as well as the combination of both of these factors had no significant impact on ground beetle species diversity, abundance, biomass, and evenness with most woodland species occurring on near to all of the four types of woodland plots. Four species, however, showed a significant preference for one of the specified woodland types studied. Our findings provide evidence that all woodland-inhabiting ground beetles of this region are able to colonize new habitats in the continuous woodland matrix, at least, up until a distance of 2.3 km. We call for a heterogeneous woodland management and increasing habitat connectivity to protect both species with a preference for ancient woodland sites and/or old trees and those species which prefer early successional stages. The online version of this article ( https://doi.org/10.1007/s10841-019-00156-8) contains supplementary material, which is available to authorized users. We would like to thank David Walmsley, Leuphana University Lüneburg, for linguistic revision of the manuscript. We would like to thank the head of the Lower Saxonian Woodland Commission Office Sellhorn, Lutz Kulenkampff, as well as the foresters Oliver Richter and Hans-Hermann Engelke for their generous support in finding appropriate plots in the woodlands under their care. We would also like to thank the Nature Conservation Agency of the district “Heidekreis” for its kind permission to conduct the study within their area of jurisdiction. Practical work was assisted by Nafisa Ibrahim, Evans Mensah, Shin-Yeong Park, Eunice Nyawira, Salome Wanjiru Gicici, Sorcha Kelly and Jan Patrick Diekmann. Moreover, Dr. Wilhelm Hülsmann supported MH with technical equipment and a car for the field work. Furthermore, MH thanks Dr. Christoph Leder for valuable comments.